Back in 2016, Mark Zuckerberg announced the launch of Facebook's Messenger Platform -- a new service that enables businesses of all sizes to build custom bots in Messenger. In the days following the announcement, the tech and marketing space lost its mind. 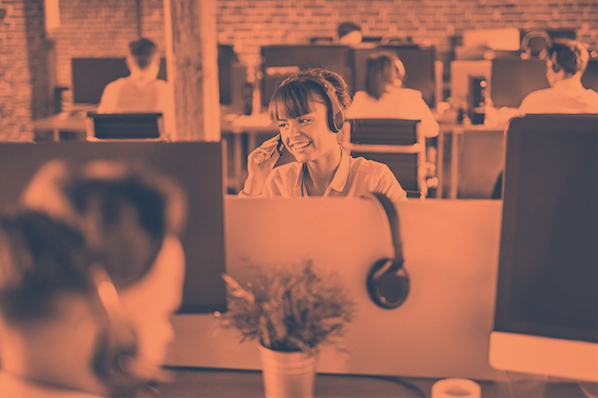 Thousands of articles were penned about the news, each one speculating on what an open Messenger platform could mean for businesses' customer service teams. Why all the ardor? For starters, Facebook Messenger already has about 1.3 billion monthly active users worldwide. Not registrants. Not people who got forced to download it when Facebook spun it out of the standard Facebook app. We're talking about active users who have adopted Messenger as a primary communication channel. Anytime a company as forward-looking as Facebook opens up a platform as heavily adopted as Messenger it should raise eyebrows. So the early excitement, well, it's justified. But what comes next is entirely undefined. And as marketers, we have an exciting opportunity to help shape it. As Zuckerberg put it in his keynote, "No one wants to have to install a new app for every business or service they want to interact with.” And bots are much different than disjointed apps. In other words, building into the already popular Facebook Messenger app could enable businesses to get in front of customers without that added friction. 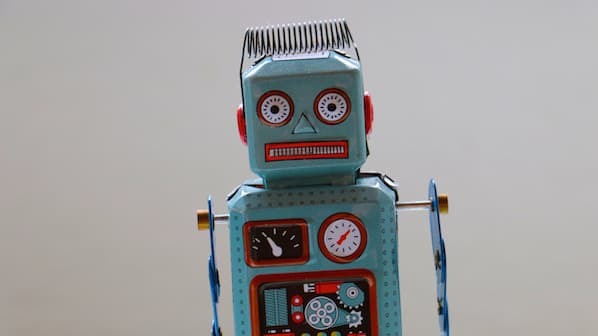 "Bot" is a generalized term used to describe any software that automates a task. Chatbots, which anyone can now build into Facebook Messenger, automate conversation -- at least the beginning stages of it. 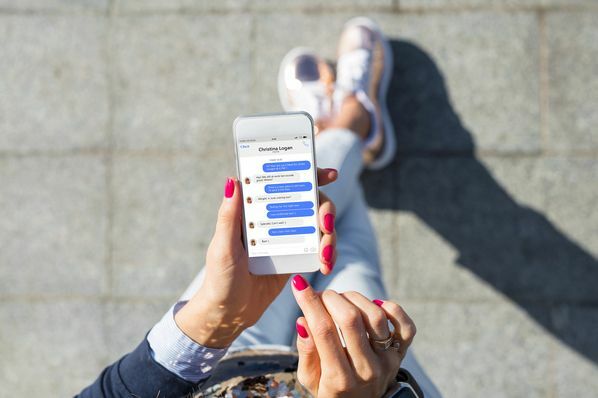 What's special about the bots you can build on Facebook Messenger is that they're created using Facebook's Wit.ai Bot Engine, which can turn natural language into structured data. You can read more on this here, but in short, this means that not only can bots parse and understand conversational language, but they can also learn from it. In other words, your bot could get "smarter" with each interaction. You've undoubtedly heard of artificial intelligence (AI). And this is a type of AI. Natural language interface is common in most chatbots, but by opening up the Messenger Platform and providing developer tools like the bot engine, Facebook has made building an intelligent bot easier. So, now comes the classic marketer question: If you build it, will they come? Users are able to search for companies and bots inside Facebook Messenger by name, so you'll probably get some users that way. But, as with any new pathway into your company, you're likely to find that adoption of this communication channel within your customer base won't happen without some promotion. Facebook is trying to make that easier for businesses and organizations as well. If you've created a Page for your business on Facebook, Messenger Links will use your Page’s username to create a short link (m.me/username). When someone clicks that link -- regardless of where they are -- it will open a conversation with your business in Messenger. 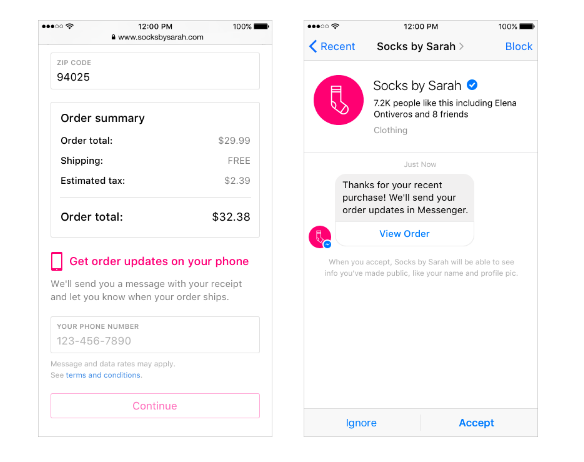 If you have phone numbers for customers and pre-existing permission to reach out to them, you can find them on Facebook Messenger via customer matching. Conversations initiated through customer matching will include a final opt-in upon the first Facebook Messenger communication. 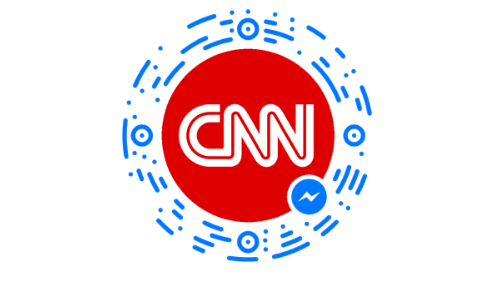 Messenger codes are unique images that serve as a visual thumbprint for your business and bot on Messenger. If you are familiar with Snapchat codes, these visual cues act in the same way, redirecting anyone who scans them using Messenger to the corresponding company page or bot. You can embed these buttons, provided by Facebook, into your website to enable anyone who clicks them to start a Messenger conversation with your company. For all of the above, if you haven't developed a bot, the result will be a standard Messenger-based conversation. So you'll want to be sure you're monitoring that channel. The example Mark Zuckerberg lauded in his keynote was the ability to send flowers from 1-800-Flowers without actually having to call the 1-800 number. A user, Danny Sullivan, subsequently tried it by sending flowers to Zuckerberg himself and documented the five-minute process here. The bot took Sullivan through a few floral options and then confirmed shipping details. With the Wall Street Journal bot, users can get live stock quotes by typing "$" followed by the ticker symbol. They can also get the top headlines delivered to them inside of Messenger. 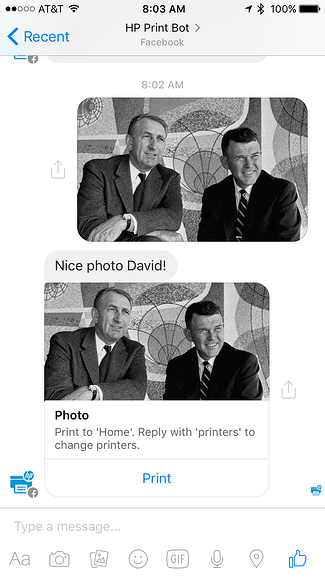 HP created a bot for Messenger that enables users to print photos, documents, and files from Facebook or Messenger to any connected HP printer. Facebook is releasing its own bot for Messenger, a personal assistant bot named "M." M can answer a wide range of requests -- from restaurant recommendations, to complex trivia, to last-minute hotel rates in the city. Its flexibility is due to the fact that M is actually a bot-human hybrid. As Facebook’s chief technology officer Mike Schroepfer told Recode: "It's primarily powered by people, but those people are effectively backed up by AIs." While the bots act as a first line of defense in fielding questions, the difficult questions are quickly routed to human assistants. Healthtap is an interactive healthcare provider that connects users to advice from medical professionals. 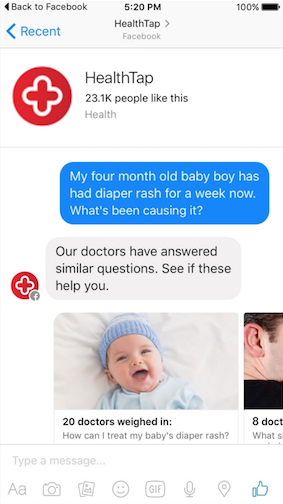 On the heels of the platform announcement, Healthtap created a bot that enables users to type a medical question into Facebook Messenger and receive a free response from a doctor or browse articles of similar questions. You can see here how the conversational interface works. The user in this example is inquiring in natural language about a specific health concern. From the user's standpoint, this is similar to texting a friend. This set up also helps the company filter inbound requests by solving some patient questions with existing responses first and then surfacing unique queries for live response. Should You Build a Facebook Messenger Bot for Business? Ah, see that's not the sort of question I can answer for you. 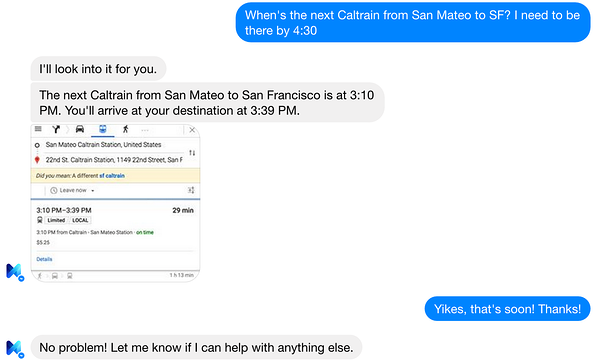 Building a bot for Facebook Messenger, like any marketing or product endeavor, is going to take resources -- mainly staff time and expertise -- and may not result in the outcomes you'd like to see. 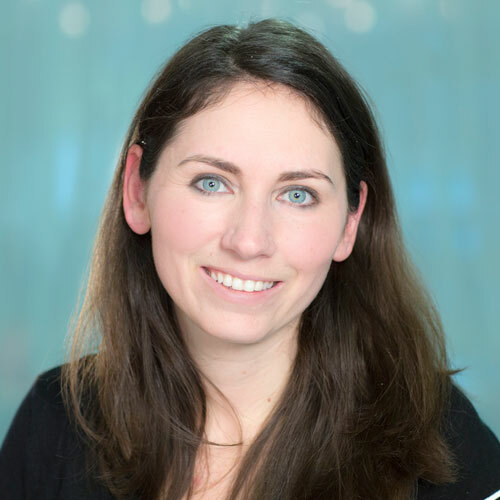 Do you have a clear use case for your bot? One of the biggest reasons so many companies went astray in building mobile apps for their businesses is that they saw it as just another version of their website. They didn't take the time to study how being on a mobile device would change the types of interactions their customers would want to have with their company. Some tasks are just not well-suited for mobile. As a result, many apps sit unused. When you're thinking about a use case for Facebook Messenger, make sure you're thinking about it from the standpoint of the customer or user, not from the company's standpoint. Perhaps you're having trouble moving leads from one part of your buyer's journey to another, and need a way to nurture their interest after they first discover your website or content and return to learn more. Traditionally speaking, a knowledge base is a section of your website that organizes all the resources and information a customer would need to properly learn and solve problems related to your product. And sometimes, these knowledge bases can be cumbersome or hard to search through. A Facebook Messenger Bot is one way to better educate customers who have questions about your product. If your customer service team has more incoming requests than they can handle, it might be because they're only taking them through the phone. Live chat bots can open more request lines, lower call volume, and allow service and support representatives to balance more questions at a time. If your customer service employees need a better way to share questions with one another as they field them, the right Facebook Messenger bot can loop in more employees more quickly to solve problems. You suffer from "abandoned shopping carts" on your ecommerce website, and need a way to retain shoppers who might have trouble during the checkout process. Is your audience on Facebook? This question is often too quickly dismissed by companies that see Facebook as a purely social platform, rather than one for businesses. Even if your audience doesn't currently use Facebook for business needs, you need to start by determining whether or not the potential for Facebook marketing is there. If you have an audience who uses Facebook heavily in their personal lives, they're likely to adopt Messenger as a communications tool. And how they use Messenger may expand beyond how they use Facebook. Today, usage of messaging apps has actually outpaced that of social networks. And as new use cases arise, behavior evolves with them. Can you support inbound inquiries from Messenger? If you've thought through the above three questions and think you've got a good foundation for a Facebook Messenger bot then dive in. There's a benefit to being an early adopter in this space. And as a newly open platform, Facebook Messenger needs thoughtful and strategic companies to shape it.